I decided to splurge on a rental car in Moorea so I could explore the island on my own schedule. At the ferry station there were two rental car counters so I went back and forth between the two and tried to get the best deal I could. Like everything else in Tahiti, rental cars are very expensive. The best deal I could get for the 24 hours was about $115 (which was on the lower end of what the guidebook said it would be so I took it). But considering what taxis cost, I figure I saved at least half that amount by not needing one. The island of Moorea is much smaller than Tahiti, only 36 miles around the perimeter along the coastal road; easy to explore in a single day with your own wheels. The interior of the island, like Tahiti, is mountainous and best explored by 4 x 4 vehicles which are also available for rental. I decided I was far more interested in exploring the shoreline so a regular car would suffice. Just a mile or two from the port the road climbs up a hill along the coastline and there is a spectacular lookout point over the lagoon and the Sofitel Resort with the island of Tahiti off in the distance. It is the kind of view that could make you veer off the road if you weren’t prepared for it. I knew it was coming up (thanks to my guidebook) but I still wasn’t prepared for just how awestruck I would be by it. I stopped the car and got out with my camera. I sat there for about 20 minutes just taking it all in: the stark contrast between the shallow, pale blue clear lagoon; the deep blue sea beyond the breakers; the thatched-roof bungalows of the Sofitel dotting the lagoon and the sandy white shoreline. It was like something out of a movie, almost too perfect to be real. From there, it was pretty easy to find my hotel. There was, after all, only one road. 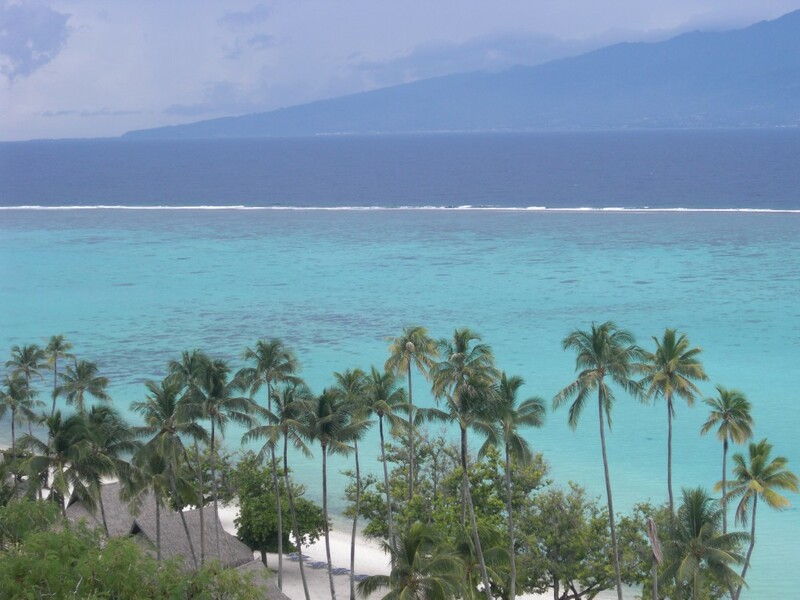 When I originally booked my hotel on Moorea, it was the Sheraton Moorea Lagoon. Two weeks before my arrival (while I was in Italy), I received an e-mail from Starwood saying that the hotel was now under new management and would no longer be a Sheraton by the time I arrived. I was very disappointed to learn this since Moorea was where I was really hoping to score that upgrade to a bungalow. If I couldn’t use my Starwood status to get an upgrade, I figured my chances were slim. Luckily, I found out while on Tahiti that it was Hilton who had taken over the hotel. This was a lucky break because I do also have “status” with Hilton. Maybe I would luck out after all. When I arrived at the new Hilton Moorea Lagoon & Spa, I was excited to be told that I had, indeed, been upgraded to what they called a “spa bungalow”. Turns out, all 106 rooms at this hotel are bungalows but only about half of them are of the “over-the-water” variety. Mine was one of three set right on the beach, half over the water and half over the beach. That’s close enough for me! Before I continue, a little history of the Tahitian bungalow…Moorea is believed to be the inspiration for James A. Michener’s mythical isle of Bali Hai and is also the birthplace of the legendary overwater bungalow. As the story goes, a trio of California guys came to the island in the 1950’s and became known as the Bali Hai boys. They developed several hotels and are credited with dreaming up the idea for the signature hotel rooms over the lagoon. To this day, the islands of French Polynesia are known worldwide for this unique style of accommodation. When I arrive at my bungalow, it is everything I hoped it would be and more. I have to say, of all the hotel rooms I’ve stayed in all over the world, this one was my favorite. From the viewing window in the floor (so addictive they are known locally as “Tahitian television”), to the private dock in the back allowing direct access to the lagoon at any hour of the day or night, this was truly a unique experience. Tiare flowers placed strategically throughout made the whole room smell like a tropical garden. Though the bungalows are not large, every inch of space is utilized efficiently and they are very well-appointed. It was my own little slice of heaven in the middle of the South Pacific. The star attraction of the Hilton resort is definitely the lagoon. Extending for what seems like miles in every direction, it is like a 4ft-deep clear blue aquarium filled with colorful coral and exotic tropical fish. The water was so clear you could almost see the fish just as well from your deck as you could under water in snorkel gear. It would be easy to spend days snorkeling, kayaking or simply walking around in it and that was, by far, the most popular activity. The convenience of your own private dock to enter the water – complete with snorkel gear and a freshwater shower – made it almost impossible to stay out of the lagoon. But who would want to? I spent as much time as I could there but eventually had to tear myself away to explore the rest of the island. I took a drive inland up to the Belvedere “lookout point”, the island’s highest point accessible by car. It was a steep, winding and mostly un-paved road and I wasn’t entirely sure my little car would make it. But, thankfully, it did. And the views were worth leaving the lagoon. After that, I followed the coast road around the island stopping for every beautiful view to take pictures. I also discovered the other good thing about having a rental car; I was able to buy some groceries in the local markets and save myself a little money on food at the hotel. Even at the markets, though, I was still surprised at how expensive everything is. I assume this is mainly because Tahiti is in the middle of the ocean and they have to import everything on freighters. This makes sense, but Hawaii is also in the middle of the ocean and it’s not nearly as expensive. Everything from a Diet Coke to a taxi ride was about 4x what you would pay anywhere else. Frankly, I found it impossible to get anything in a restaurant for less than $25-$30. So, I pretty much stayed out of restaurants and stuck to the market and to-go food – why not when I had the best view of all from the balcony of my bungalow? I was, however, extremely happy that I thought to buy that bottle of wine in New Zealand (a glass of wine could easily run $15). I’d been doing so well on the trip budget this year that it just pained me to feel like I was overpaying for every little thing. I tried to forget about it and focus on the beauty of my surroundings. Nobody wants to be cheap in paradise. Later that day, it was sadly time to leave Moorea and head back to Tahiti. This time I took the smaller, hi-speed ferry and it was a shorter (and much bumpier) ride. I thought Tahiti was beautiful when I arrived but now that I have spent some time on Moorea, it seems almost like a letdown to go back. The good news was that when I did arrive back at Le Meridien, they had upgraded me to one of the few overwater bungalows for my last night on the island. I was excited about that but, unfortunately, the Meridien’s bungalows just didn’t measure up. Although beautifully decorated, they were missing my two favorite things from Moorea, the viewing window and the dock! What is the point of an overwater bungalow if you can’t see through the floor into the water, or get in the water from your own dock? To get to the water you had to go all the way back down the boardwalk and then swim in from the beach. The good news? Another bottle of Moet (to take home with me) and a 10pm late check-out granted for my 1am flight to LA. The view from the balcony was great and you could still look down into the water and see the fish and coral clearly but the clarity of the lagoon water just wasn’t anywhere near what you could find on Moorea. On my first two nights, I didn’t have anything better to compare it to, now I do. So, I guess I’m now one of those obnoxious people who says “Oooh, don’t go to Tahiti, it’s so over-rated, head immediately for the outer islands.” Sadly, it’s true. Of course, I am certain the island of Tahiti had much more to offer than what I saw since I barely left my hotel so I’d certainly be willing to give it a second chance. I will take this opportunity to mention that if you have ever wanted to travel to Tahiti, now is definitely the time to go. Tourism to the area has taken a major hit due to the economic crisis and rooms are the one thing that can be had for a song. For example, the two overwater bungalows I stayed in would easily cost $1,000/night under normal circumstances. Now, I suspect you could get one for ¼ of that. I spoke with the manager at the Hilton and she said they were currently at only 20% occupancy and were using the downtime to renovate many of the bungalows. But she admitted that they are very concerned about the upcoming spring high-season, bookings are way down and they are slashing rates and creating package deals that include meals. My advice, if you do go, is to try to get one of those package deals with meals included. It will save you from the menu sticker-shock I had and make your trip much more enjoyable. Oh yeah, and BYOB! I wish there had been time for Bora Bora on this trip but it takes an inter-island flight to get over there and there just wasn’t enough time (or enough money) to do it all. Next time I come back I will definitely make time for it…and if I win the lottery between now and then, I might even be able to eat while I’m there. Next up, one last stop in Belize!